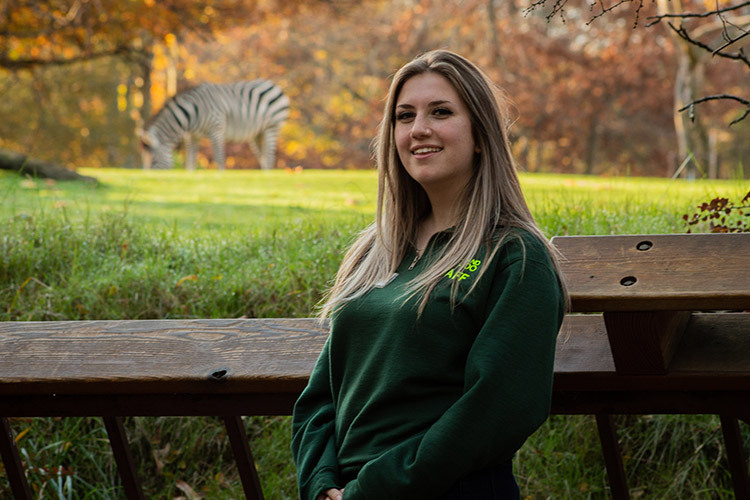 Gigi Gaultier worked as a learning facilitator at Woodland Park Zoo, where she worked with high school students on leadership skills and a climate action project. I gripped the edges of my letter from the University of Washington. Waitlisted. I knew I was in over my head expecting myself to get into UW. I had set myself off from the “normal” track by doing Running Start and was worried that this put me at a disadvantage, especially because I wasn’t an over achiever. I remember writing an appeal to be taken off the waitlist. But, how are you supposed to tell the people you’re trying to impress that they’re wrong? I must have figured it out. Finally, the last weekend before August, I got a call saying I was admitted into the University of Washington. My first year I felt out of place. How have my classmates already gotten involved in two research projects and it’s only fall quarter of freshman year? I stuck to the bare minimum, scraped by in my classes and avoided any and all social interactions outside of my dorm hall. Even then I wasn’t doing amazing in my classes, and I had to retake Chemistry 142. Yikes. I never really viewed myself as a leader. In fact, I don’t think I could have even defined the word leadership for you. I walked around campus intimidated by everybody else’s accomplishments, but never really credited myself for my own. I constantly felt like I didn’t belong here. So, I took matters into my own hands and applied to be an orientation leader (OL) for First Year Programs at UW. With such a large pool of applicants, I thought that there was no way they would accept someone as uninvolved as me. I was wrong. For a full summer, I was thrown into a group of 26 incredibly supportive leaders. For the first time at UW, I felt like I belonged somewhere. Everyone was so open about their setbacks, I felt like I could be accepted for my own struggles. Day-by-day, I was building up the confidence in myself to lead through relationship building and being vulnerable. Being put in this so-called “leadership” role was scary at first. By jumping in, I was starting to realize that everyone has that capacity to lead through their own unique style. Just as others had done for me, I opened up to my students about failures and struggles I had, and I realized that so many students could relate. This was the start to finding my voice in leadership. Things really started to come together my junior year. I was asked to step in as a First-year Interest Group (FIG) Leader for someone who had dropped the program. 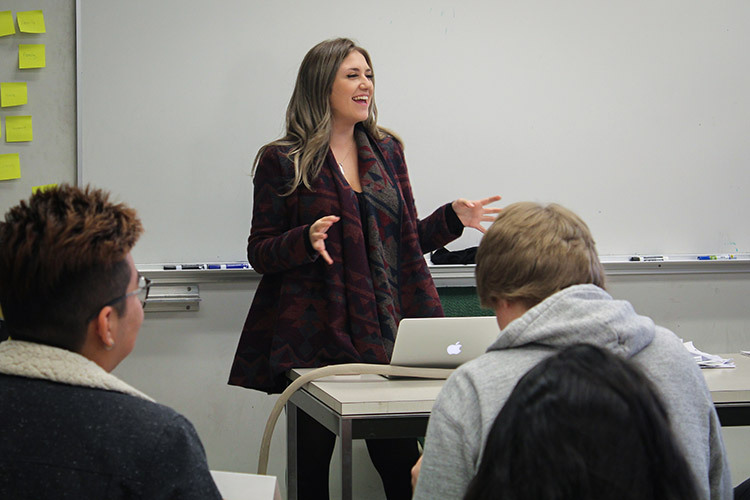 I had no experience teaching and was more than under prepared to teach my first day of class. Yet somehow, I felt like I was doing something right. I never in a million years imagined myself being asked to do something I didn’t apply for. Once again, I was challenging myself to do something out of my comfort zone. But once again, I loved it. At the end of that quarter, I learned about the Husky Leadership Certificate. What’s cooler than getting to work with a mentor one-on-one on your leadership skills and developing a better sense of yourself? For five months, I talked with my mentor, Fran, to analyze every little detail about my experiences and what leadership meant to me. Every time I got to talk about how much my students inspired me, I lit up. You know those moments when you love something so much that your heart warms up and you get a little light headed? That’s what I felt every time I talked about how much my students had impacted me. I was slowly realizing that leadership education was becoming a huge part of my life. I kept wanting to do more. I searched high and low for the perfect leadership education role that would fit hand-in-hand with my environmental background and aquatics and fisheries major. When I found a listing for a learning facilitator at the Woodland Park Zoo, I knew I had found my dream job. I worked with every UW resource there was trying to craft the perfect resume and make myself sound applicable without bragging on my cover letter. My dream job eventually became my reality. This job was all about youth leading youth to help them see they could make a difference. I was there to help empower leadership skills in 16 high school students working on climate action projects for six months. On my first day teaching, I gathered up all my materials and went in with so much excitement and so many questions to ask them. I was met with blank stares. Yikes again. I went back to the drawing board and spent the next month developing a leadership curriculum that included activities like personality tests, understanding one’s values, true colors, and one-on-one meetings. I worked hard to build a framework so that my students could develop a better understanding of themselves and their leadership skills. I realized that I didn’t know everything going in. I did know that I was passionate though. And more importantly, I was going to make it fun. This tree is an art project that Gigi’s high school students came up with. 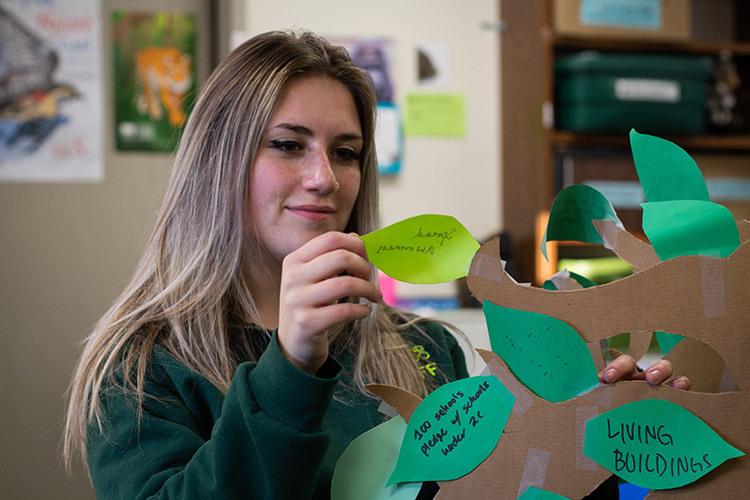 At their climate action summit, people were encouraged to write down a climate action they could take on a leaf and attach it to the tree. By the end of the summit, the tree was full of leaves and action. Over the course of the next six months, it was most definitely fun. The more my team got to know each other through leadership building activities, the easier the work seemed to be. My students enjoyed working with each other because they felt like they were friends. Those faces that were once blank stares were now smiles, cracking jokes with one another. We ended our summer with a Climate Action Summit ran completely by youth, and I couldn’t be more proud. Watching my students develop into young leaders and accomplish what they put their minds to was the more rewarding part of it all. Despite my successes, I was still having setbacks. That’s just the reality of it. I could be teaching people leadership skills but still not be perfect in my own — and that’s okay. I applied for the Husky 100 and a few other positions on campus that I ended up not getting. These setbacks only encouraged me to work harder. In my senior year, I now work as a mentor for UW Leaders and am a returning FIG leader. I definitely had my fair share of “yikes” moments along the way but I can’t thank UW enough for giving me opportunities to help me grow. I truly feel like I belong in this puppy park we call the Dawg House. As I now have five tabs open on my laptop for education leadership graduate programs around the country, I can confidently say that I feel ready to tackle all the “yikes” in the real world. Gigi Gaultier is currently a senior working towards a bachelor of science in aquatic and fishery sciences. She is minoring in marine biology and music. When she’s not studying or working, Gigi enjoys writing music or hanging out with her amazingly supportive friends.